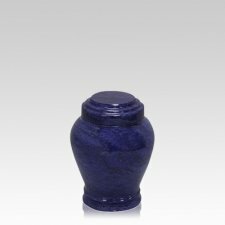 The Virtue Marble Keepsake Urn is made of natural marble which is stained blue. The timeless shape of the stone will bring peace to your heart, while the vibrant color throughout will create a stunning visual effect. Because this urn is made of natural materials, slight variances in the color and patterns are to be expected. This keepsake urn is perfect to keep a small part of your loved one near by at all times.